Motherhood is a gradual series of Letting Go. Some days it’s harder than others. Today is one of the hard days. Long story short, this means she’s living among the people she’ll serve, at the poverty level…by design. She knows she’ll be stretched thin and pulled outside her comfort zone. Figuratively, sure, but also literally. A few weeks ago she took part in a 48-hour weekend homeless immersion experience where she “entered the world of poverty and homelessness [to] discover the unique challenges of ministry among those on the margins of society.” She wrote a recent update for her supporters, and I asked her permission to share excerpts of it below. Even if you discover this post after the fact, please pray. While the Refugee Weekend ends on Sunday, there’s no doubt its impact will linger, and the Fellowship is ongoing. 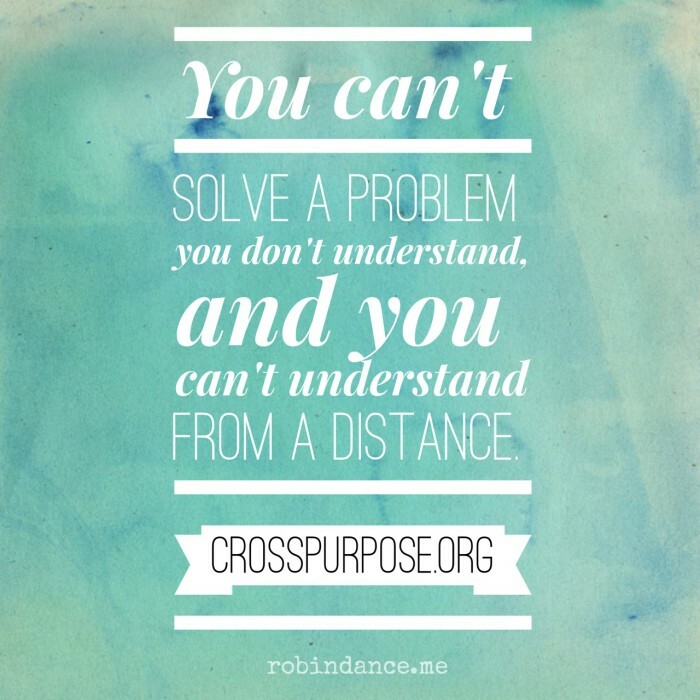 Please continue reading for a glimpse into the life of a CrossPurpose Fellow. My daughter would be the first to shrug off any personal accolade, but the program is special and what they’re doing is revolutionary. This new skin I put on smelled bad. It was baggy and stretched from walking for miles. It did not endear me to others; on the contrary, this skin and the words that came from it garnered a type of reaction I’ve never before received. Dread dropped into my stomach to mix with my hunger as we were given a series of assignments throughout the weekend intended to provide a brief glance into the lives of those who have no place to call home. People who didn’t know better would easily make assumptions about who I was. What I was. Introspective, Rachel acknowledged thoughts and ideas that brought conviction to my own heart. This weekend my girl and others in her Fellows Program will take part in another Urban Encounter – one designed to gain a little insight into the Refugee experience. My mama-heart would greatly appreciate your prayers on her (and their) behalf. CrossPurpose has created an incredible urban leadership program through its Fellowship. Those willing to devote two years of their lives to learn and then live (and work) differently, are some of the bravest people I know. These are the kind of crazy people who are changing the world by daring to believe – and most importantly, live – what they profess. Please click if you’re interested in learning more. Please sponsor a child today…! Had I not had a house seriously overflowing with family last weekend, this week’s Around/About would have been shared then. The beautiful thing about the internet is you can visit blog posts, well, forever, and the words I’m about to share are relevant whenever you read them. 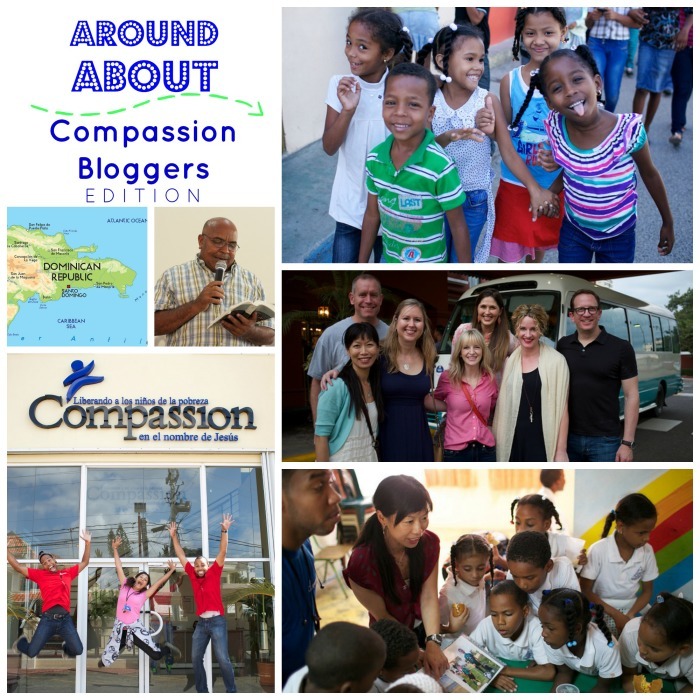 A group of bloggers have just returned from the Dominican Republic, where they visited the local Compassion International field office and several of the local projects and families who benefit from its programs. I had the incredible privilege of traveling on a Compassion blogging trip to Calcutta five years ago, and I remain convinced it’s one of the best organization of its kind. Sponsoring a child through Compassion is one of the most meaningful things you could ever do, especially if you involve your school-age children. Not only will they gain an international pen-pal, but they’ll see the world through an incredible lens – that of hope despite unimaginable poverty – and they’ll also be blessed as they bless another through their letters. It’s a beautiful way to teach them consideration of others not just in theory but in practice. Here’s a link to Compassion Blogger highlights from the week, but I hope you’ll take time to visit the entire team. You’ll come away inspired, and I hope, ready to sponsor a child. “…We say yes. Yes. Yes. A thousand yeses. Wondering if it will unfold into some…something. And then one day. A day that seemed like it would be just a day, breaks open like a piñata you’ve been swinging at for years. “…A college educated man or woman in the Dominican Republic is not exempt from the poverty. So we pressed for more specifics. Amazing trip photography by Mike Varel, Digital Storytelling (all images in the above collage from their Flickr pool). You might hate me for what I’m about to tell you, but I think it’s in your best interest To Know. Mind you, I’m giving you the benefit of warning, a few seconds to steady your footing. When I was told, on the other hand, my well-meaning friends–men–thoughtlessly dumped it in my lap like it wouldn’t boulder-crush my heart, at least temporarily. Eventually, after Unsolicited Parenting Advice Shock diminished, I decided that although it felt better to be a blissfully ignorant ostrich, it wasn’t actually better. By the time your Littles celebrate their 10th birthday, they will already have lived over half the life they’re going to under your roof. You’re not raising your children for yourself, you’re raising them for someone else. There. I’m feeling your repugnance, your revulsion, your rage. How DARE I compel you to think about such things! You were fine living in the moment or perhaps longing for the day your toddler might take a first step, tie her shoes, wipe his own behind! than my own children’s diapers. My daughter has 179 days left of high school and dangerously soon she’ll wear the face of 18. Gaze fixed on blue skies, she’s already fluffing her wings. My son is venturing into new territory–he’s driving, attending a new school, and his chin rests too comfortably on top of my head. Though I hold him with open hand, it trembles. Imperceptible to him (I hope), but reverberation that rattles my core. While I’ll never stop parenting (is that possible?) I realize this phase of being a mom is almost over. I’m good with that, really I am, but what comes naturally isn’t always easy. I’ve never been a smother-mother; this overwhelming desire to clinch the reins of time to s l o w i t d o w n frustrates me. I’m at the center of the spectrum of “letting go” and “holding tight” and I’m torn. Maybe, at least in part, that’s why God knows sometimes I need my own, front yard miniature rainbow. So…today is “back to school” for two of my three; I will be at the bidding of my youngest who most likely has an agenda of his own. That makes me smile. I wouldn’t dare tell you how to parent and I realize every family is different, but hearing those pieces of advice years ago have helped me navigate through the years. Hold on to what helps, toss what doesn’t fit and remember “this too shall pass”…the good times, and when you’re at the end of your Mama-rope? The not-so-good, too. of my life so far." industries should deliver–imagine this–excellent service, you can begin to see where this volatile combination might ignite. kindly communicated. My philosophy is I'd want to know if I were in their shoes. to circumstances or people. I do exercise restraint and discretion, I keep my mouth shut more often than not...but sometimes I'm compelled. opportunity to go to Guatemala and meet their sponsored child…a once-in-a-lifetime opportunity!" Last summer our entire family also read "Do Hard Things: A Teenage Rebellion Against Low Expectations ". It's an inspiring book about rejecting mediocrity (I strongly recommend it if you have a tween, teen…or plan way ahead). I could be wrong, but I think the timing of reading these two things close together encouraged Rachel to pursue sponsoring a child through Compassion and to take part in Brio's mission trip. Without rehashing my previous post, suffice it to say she was determined to make it happen. Though it wasn't her only motive, Rachel was most excited about meeting her sponsored child, Evelyn. Yes, she wanted to minister to others; certainly, she was intrigued with visiting another country and culture; but meeting this little girl she had faithfully written for months–and who had written to her in return!–was what she was most looking forward to. Imagine her disappointment when she found out two nights before the day she was supposed to meet Evelyn, it wouldn't happen unless she (and her best friend Kate, who co-sponsors Eveylyn) could come up with an extra $300-350 to fund Evelyn and a guardian's travel expense! Because she had to let her leaders know right then, she called us for advice; our phones were off because it was after midnight. Kate was able to reach her mom who didn't say "no", but discouraged them. They already had invested thousands of dollars and $300 more on short notice wasn't realistic. To say I wasn't happy is an understatement–I knew what this meant to the girls! While I wasn't sure what their final decision had been, it was reasonable for me to assume they declined the offer (based on what Kate's mom shared with me). I wrestled with how to respond all day; or whether to stay out of it all together. Compulsion to "speak" over-rode restraint. I emailed our trip contact, expressing my anger, frustration and disappointment. While I was quick to praise trip planners for their added safety measures, attention to detail and impact they were having in my daughter's life, I clearly detailed why this was a huge failing that impacted not just my daughter, but many others–I wasn't advocating just for her, I really felt the need to speak for all who were affected. The next morning I had two email responses from trip leaders (Susie with Brio Magazine and Calab, Big World Ventures partner). They thanked me for writing, heard my heart and felt my Mama Bear pain. They explained that because so many readers had sponsored children in Guatemala City, Compassion had had to draw children from projects outside the area; areas remote enough it was costly to bring them in to meet their sponsors. Because Caleb and Susie were kind, apologetic, attuned to my specific concerns and responsive, they assuaged my anger. They responded exactly how I would have had our roles been reversed. That's all I was looking for–a place to absorb and diffuse my fury. Well, that, and the hope my words might assure this wouldn't be repeated in subsequent years. Throughout the day, Susie and Caleb remained in email contact. Both were in touch with Compassion offices and Susie let me know that somewhere there had been a breakdown in communication—the kids were never supposed to fund their sponsor children’s travel expense! They were scrambling at the last minute to arrange as many sponsor/child visits as possible, realizing not everyone would get to. We didn’t know Rachel, Kate and Evelyn’s fate, and I was reluctant to get my hopes up for them. Having the amazing privilege of meeting one of my own sponsor children, I understood what was at stake. I wanted this so badly for them it make my heart ache. So I pray-wished throughout the day, trying to seek God but tripping over my flesh-inclined binding. If I thought it would have worked, I would've bargained with God. "It was the best day of my life so far!" Did my email make a difference? I doubt it. Was it the right thing to do? I'm pretty sure it was. Was I blessed by the end result? Is that really a question that needs to be asked? What I do know is this: when I feel a compulsion to speak for those who have no voice or need an advocate…it most definitely is a time to speak. Postscript: I can't let a post that mentions Compassion International not give you an opportunity to sponsor a child in need. After SEEING the difference Compassion makes in the life of a children and their families, I'm begging you to begin a relationship with a little one in need TODAY. Click here to find out more! Also, because I think so highly of the book "Do Hard Things", I'll be giving away a copy to a lucky reader. All you have to do is make a pertinent comment to this post :). "We do need to warn you…these kids are not the same!" It's been two of the longest weeks in my life, but I imagine two of the shortest weeks in hers. 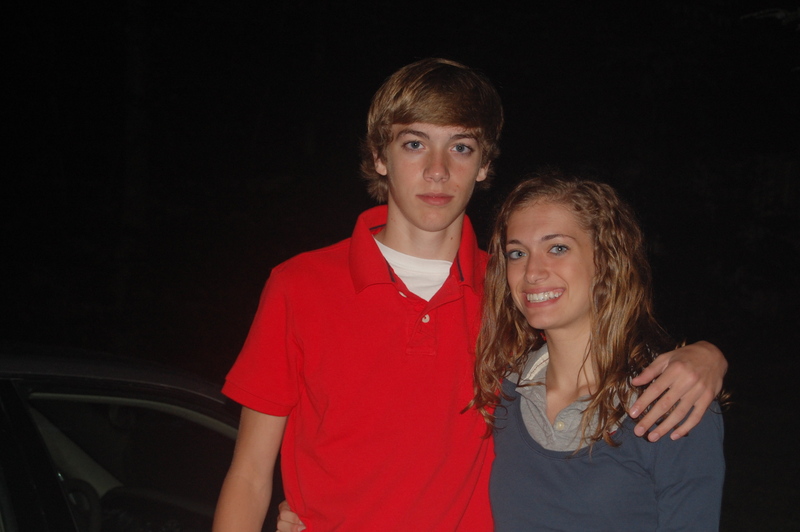 A mission trip billed as "Never The Same '09" has lived up to its name. She's been on the mountain, grown her family, fed the hungry, played the role of nurse and lived her faith, and a radiant countenance belies all these things. Plus she likes vegetables now. Go figure. Perhaps I'm being overly dramatic, but I sense my daughter has stumbled into her calling. What tells me this? She can't stop smiling. I see it in her face now, but I heard it in her voice shortly after she met her team members. This is significant. For years (though it's hard to remember now) it bothered me she didn't smile often enough. I–one who believes "you're never fully dressed without a smile"–almost took it personally. Wasn't a smile an outward expression of an inner working? Did her solemn expression mask inner fear? unhappiness? worry? Recently, I've seen this little caterpillar of mine wiggle out of her self-spun cocoon; her metamorphosis, though welcome, was unexpected. Physical growth and changes are easy to detect, but an evolution of the soul? A transforming of the mind? Subtle shifts in personality and behavior and response to others? It would've been so easy--too easy--to miss had I just been looking with my eyes. Thankfully, my heart was listening and looking. I'm thinking while I write, and I remember a handful of conversations she and I had over the past year. We were fully present and engaged and seized "accidental" moments. She had questions and invited me to share my answers. She acknowledged frustrations, revealed her hopes, admitted fears, confessed sin and dared to dream out loud. Time is requisite for your kids to be willing to share their heart with you. It can't be rushed or manipulated or coerced. They have to know you're fully present; especially as they grow older. It was time for her to speak. "It was the best day of my life so far." This is when it was time for me to speak...to be continued….